Nomvula Mokonyane warned protesters that ANC members would defend the party’s headquarters and Zuma. 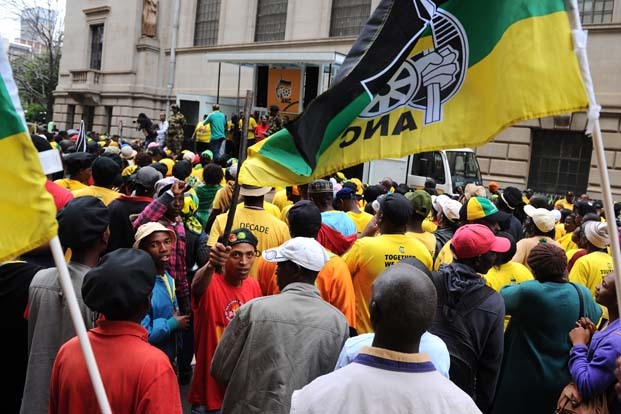 The battle lines between rival factions in the ANC have been drawn, with one going as far as warning that it will defend Luthuli House with weapons on Friday. Addressing an ANC Youth League rally in Ekurhuleni last night, ANC NEC member Nomvula Mokonyane warned those planning a march on Luthuli House on Friday that they will defend the party’s headquarters. They will also defend President Jacob Zuma, who is under tremendous pressure to step down following his unpopular Cabinet reshuffle last week. Defending the reshuffle, Mokonyane did not mince her words. Mokonyane went on to question the integrity of those who leaked the ANC’s integrity report in which it was apparently recommended that Zuma step down. She stressed that Zuma will be president until 2019. ANCYL members later reiterated that they would defend Luthuli House “with sjamboks and all weapons at our disposal”.